If you want your privacy, but also want to keep things light and bright, this is your shade. No drill, no screws, no brackets—just trim, peel, and stick. One of our most private shades, the sophisticated fabric of this shade saves energy by reflecting light and heat. Installs in less than one minute. No drill, no screws, no brackets - just trim, peel, and stick. Size : 91 x 162 cm. Shade trims to fit windows 45 to 91cm wide. Get a sophisticated look at a great price! The soft honeycomb cellular fabric traps cool air, keeping your room warmer in winter. includes also 2 plastic brackets and 4 screws for mounting. Imagine... an attractive, fully functional and inexpensive window blinds you can install in seconds, with no holes, tools or harware - anytime you have a need for a window covering. No nails, screws or brackets ! 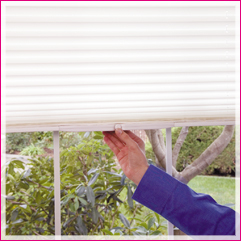 Redi Shade temoprary blinds hang and remove in les than one minute. That is Redi Shade made in USA ! Perfect for new move-ins, apartments or during painting, remodling or fabrication of custom window coverings. Handy for dorm rooms, basements and garage too ! If you love traditional corded shades but hate the frustrating installation process, youve come to the right place. 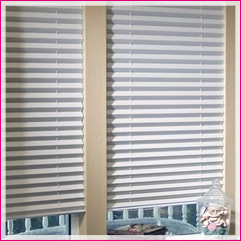 Our corded shades are just as easy to install as our Original clipped shades : just trim to size right at home and stick. The sophisticated fabric of tthose shade saves energy by reflecting light and heat. Installs in less than one minute. No drill, no screws, no brackets Adjusts with cord. No matter what the season or what your décor, our cellular shades are the beautifully easy solution. The soft honeycomb cells provide attractive money-saving insulation that keeps your house cooler in the summer and warmer in the winter. 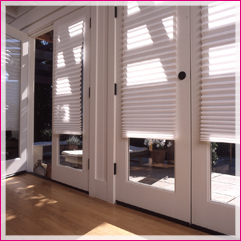 Trim at home or made to order, all of our cellular shades are easy and fast, giving you a custom look without the custom price. 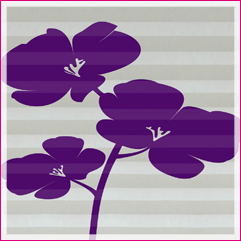 Custom your shade with a decorative sticker.